Based on the GM sales report, we know that General Motors’ first batch of 2014 Chevrolet Corvette Stingray Coupes included 485 examples of the new Vette reaching happy new owners around the country in September. That is a pretty solid figure but when you consider that shipments didn’t begin leaving the Bowling Green facility until the second half of the month, we can expect that October will bring about even greater delivery figures for the 2014 Corvette. It should be noted that the company sold 831 Corvettes last month which means that dealerships sold 346 2013 model year Corvettes but when you look at the fact that GM sold 1,351 Corvettes in the same month last year – it is clear that we can expect much bigger sales numbers for the new sports car as the company gets more units to dealerships. The folks at Autoblog had a chance to talk to GM spokesman Monte Doran and Mr. Doran offered some interesting statistics on the first group of 2014 Corvette Stingray Coupes sold last month. First – and not surprisingly – the vast majority of 2014 Corvettes sold thus far have been purchased by people who already own a Corvette. These loyal enthusiast buyers are more likely than an “average buyer” to add options and accessories (although I don’t know that the Corvette has many walk-in buyers who drive out with pure base models) and that has translated to the majority of these early Corvettes being very well equipped with an obvious focus on performance. When the 2014 Chevrolet Corvette Stingray Coupe debuted earlier this year in Detroit, it wore the striking Z51 package and the vast majority of the C7 Corvette show cars on display over the past 9 months have also sported the high performance option package. In fact, that 2014 Corvette that we recently watched tear down the quarter mile was wearing the Z51 package on top of the top of the line 3LT trim. This $2,800 package adds features like larger front and rear wheels, an electronic limited slip differential, larger front brakes, sport tuned suspension, transmission and rear differential coolers, Michelin Pilot Super Sport tires and an aero package that adds high speed stability as well as a more aggressive look. Not surprisingly, the Z51 package has proven to be a big hit with buyers as a whopping 75% of the first 485 2014 Corvette owners have selected the Z51 package. That means that roughly 364 Corvettes on the street so far are equipped with the Z51 package and of those, 197 are also fitted with the high tech and high performance Magnetic Selective Ride Control system that tacks on another $1,800 to the final price. In other words, almost half of the Corvettes sold last month had at least $4,600 worth of options when they left the plant. 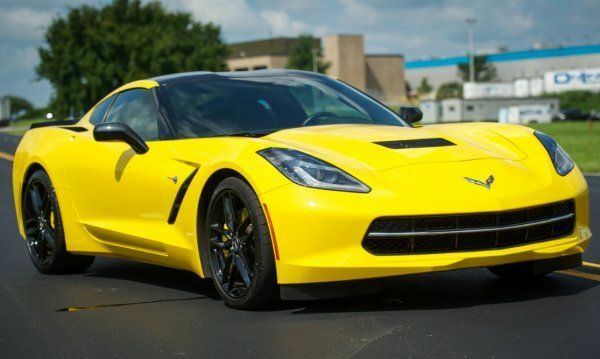 One other key statistic on the first month of sales for the 2014 Chevrolet Corvette Stingray Coupe is that 38% have been fitted with the new 7-speed manual transmission (184 units) while the rest have featured that 6-speed automatic transmission with paddle shifters that adds $1,350 to the final price. While a 38% take rate for the manual transmission feature in a true sports car might seem low, it is not. For comparison, the Chevrolet Camaro only has a manual transmission take rate of around 30% and while most diehard performance drivers would prefer the clutch pedal, we need to take into consideration that high number of decrepit babyboomers with bad hips and sore knees who are snatching up the first C7 Corvettes – a group comprised of many, many members who aren’t physically capable of rowing their own gears. Of course, you also have to take into account the socialite “image buyer” types who bought a Corvette because it looks cool but since they aren’t coordinated enough to drive a manual, they bought an automatic. This high take rate for the self-shifting automatics could be why GM is rumored to be working on a dual clutch gearbox for the Corvette – a transmission that would increase performance and efficiency. As time goes on, the number of heavily optioned 2014 Corvette Stingray Coupes may drop a bit as the enthusiasts looking to spend the most money have gotten their fill but unlike the Camaro (or Ford Mustang), we are likely to see a great many C7 Corvettes loaded up as they reach owners – at least over the next few months and into next spring.